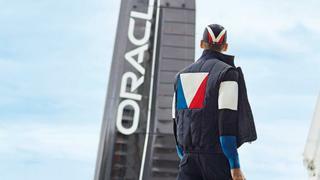 As part of its remit as the official title sponsor of the 35th America’s Cup, luxury French fashion house Louis Vuitton has unveiled a new collection inspired by the classic yacht race. Focusing largely on menswear and lifestyle accessories, the collection features chunky knits, casualwear, outerwear and polos in a traditional naval palette of red, white and blue. Designer Kim Jones has also delved into the Louis Vuitton and America’s Cup archives and uncovered graphic prints including the Gaston V, Semaphore and Victory Boat which have been emblazoned on a number of key pieces. 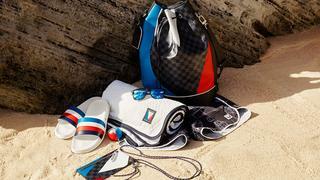 A series of leather goods have also been created using the house’s iconic Damier Cobalt Regatta canvas. A number of small items, including sea-inspired cufflinks, backpacks, men’s boat shoes, scarves and luggage are already available to buy online with the full collection available from selected Louis Vuitton stores from the end of April. In addition to the new collection, Louis Vuitton also unveiled a bespoke America’s Cup trophy case in 2015 which will be used to house the world’s oldest sporting trophy until its winner is decided. Representing more than 400 hours of craftsmanship, the brown leather trunk has been created in the style of Louis Vuitton’s famous suitcases and is embossed with the LV monogram. Louis Vuitton’s long-standing association with the America’s Cup sees it once again serve as the title partner of the America’s Cup World Series, America’s Cup Qualifiers and Challenger Playoffs. The brand will also be the presenting partner of the America’s Cup Match which is due to take place in Bermuda in 2017.